The use of big data and analytics in education continues to grow. The most common and successful use of this technology so far has been in the identification of students at risk of dropping out of their courses (Jørno & Gynther, 2018: 204). The kind of analytics used in this context may be called ‘academic analytics’ and focuses on educational processes at the institutional level or higher (Gelan et al, 2018: 3). However, ‘learning analytics’, the capture and analysis of learner and learning data in order to personalize learning ‘(1) through real-time feedback on online courses and e-textbooks that can ‘learn’ from how they are used and ‘talk back’ to the teacher, and (2) individualization and personalization of the educational experience through adaptive learning systems that enable materials to be tailored to each student’s individual needs through automated real-time analysis’ (Mayer-Schönberger & Cukier, 2014) has become ‘the main keyword of data-driven education’ (Williamson, 2017: 10). See my earlier posts on this topic here and here and here. Near the start of Mayer-Schönberger and Cukier’s enthusiastic sales pitch (Learning with Big Data: The Future of Education) for the use of big data in education, there is a discussion of Duolingo. They quote Luis von Ahn, the founder of Duolingo, as saying ‘there has been little empirical work on what is the best way to teach a foreign language’. This is so far from the truth as to be laughable. Von Ahn’s comment, along with the Duolingo product itself, is merely indicative of a lack of awareness of the enormous amount of research that has been carried out. But what could the data gleaned from the interactions of millions of users with Duolingo tell us of value? The example that is given is the following. Apparently, ‘in the case of Spanish speakers learning English, it’s common to teach pronouns early on: words like “he,” “she,” and “it”.’ But, Duolingo discovered, ‘the term “it” tends to confuse and create anxiety for Spanish speakers, since the word doesn’t easily translate into their language […] Delaying the introduction of “it” until a few weeks later dramatically improves the number of people who stick with learning English rather than drop out.’ Was von Ahn unaware of the decades of research into language transfer effects? Did von Ahn (who grew up speaking Spanish in Guatemala) need all this data to tell him that English personal pronouns can cause problems for Spanish learners of English? Was von Ahn unaware of the debates concerning the value of teaching isolated words (especially grammar words!)? The area where little empirical research has been done is not in different ways of learning another language: it is in the use of big data and learning analytics to assist language learning. 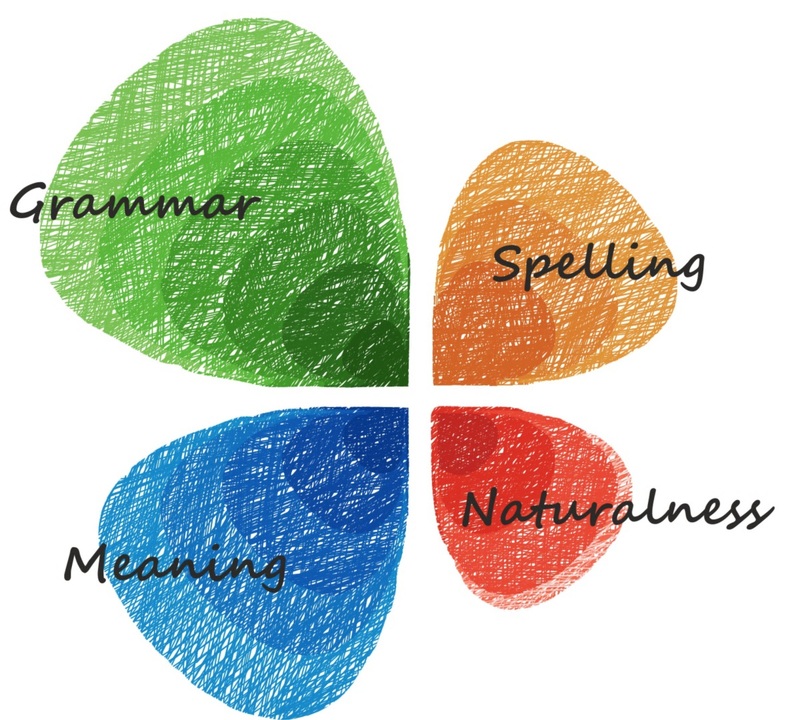 Claims about the value of these technologies in language learning are almost always speculative – they are based on comparison to other school subjects (especially, mathematics). Gelan et al (2018: 2), who note this lack of research, suggest that ‘understanding language learner behaviour could provide valuable insights into task design for instructors and materials designers, as well as help students with effective learning strategies and personalised learning pathways’ (my italics). Reinders (2018: 81) writes ‘that analysis of prior experiences with certain groups or certain courses may help to identify key moments at which students need to receive more or different support. Analysis of student engagement and performance throughout a course may help with early identification of learning problems and may prompt early intervention’ (italics added). But there is some research out there, and it’s worth having a look at. Most studies that have collected learner-tracking data concern glossary use for reading comprehension and vocabulary retention (Gelan et al, 2018: 5), but a few have attempted to go further in scope. most interaction took place between 3:00 and 5:00 pm. The authors of this paper conclude by saying that ‘the results of this study suggest a number of new avenues for research. In general, the authors plan to extend their analysis of exercise results and applied exercises to the population of all schools using the online learning platform more-online.at. This step enables a deeper insight into student’s learning behaviour and allows making more generalizing statements.’ When I shared these research findings with the Austrian lower secondary teachers that I work with, their reaction was one of utter disbelief. People get paid to do this research? Why not just ask us? EU funding for this VITAL project amounted to 274,840 Euros. The technology for capturing the data has been around for a long time. In my opinion, nothing of value, or at least nothing new, has been learnt. 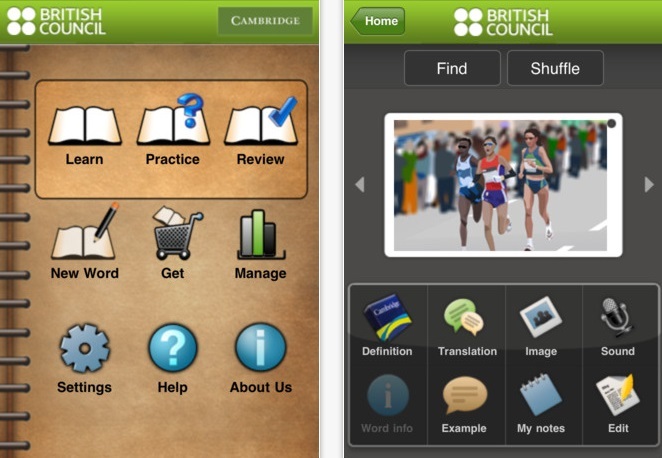 Publishers like Pearson and Cambridge University Press who have large numbers of learners using their platforms have been capturing learning data for many years. They do not publish their findings and, intriguingly, do not even claim that they have learnt anything useful / actionable from the data they have collected. Sure, an exercise here or there may need to be amended. 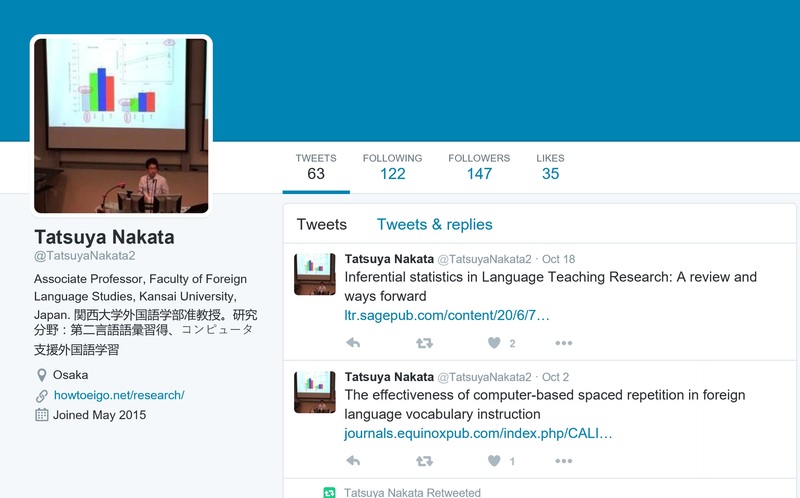 Both teachers and students may need more support in using the more open-ended functionalities of the platforms (e.g. discussion forums). But are they getting ‘unprecedented insights into what works and what doesn’t’ (Mayer-Schönberger & Cukier, 2014)? Are they any closer to building better pedagogies? On the basis of what we know so far, you wouldn’t want to bet on it. It may be the case that all the learning / learner data that is captured could be used in some way that has nothing to do with language learning. Show me a language-learning app developer who does not dream of monetizing the ‘behavioural surplus’ (Zuboff, 2018) that they collect! But, for the data and analytics to be of any value in guiding language learning, it must lead to actionable insights. Unfortunately, as Jørno & Gynther (2018: 198) point out, there is very little clarity about what is meant by ‘actionable insights’. There is a danger that data and analytics ‘simply gravitates towards insights that confirm longstanding good practice and insights, such as “students tend to ignore optional learning activities … [and] focus on activities that are assessed” (Jørno & Gynther, 2018: 211). While this is happening, the focus on data inevitably shapes the way we look at the object of study (i.e. language learning), ‘thereby systematically excluding other perspectives’ (Mau, 2019: 15; see also Beer, 2019). The belief that tech is always the solution, that all we need is more data and better analytics, remains very powerful: it’s called techno-chauvinism (Broussard, 2018: 7-8). Decent research into adaptive learning remains very thin on the ground. Disappointingly, the Journal of Learning Analytics has only managed one issue so far in 2015, compared to three in 2014. But I recently came across an article in Vol. 18 (pp. 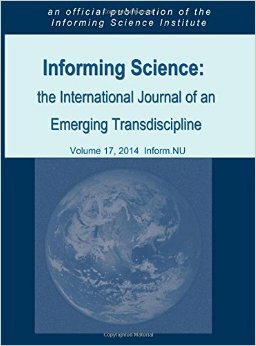 111 – 125) of Informing Science: the International Journal of an Emerging Transdiscipline entitled Informing and performing: A study comparing adaptive learning to traditional learning by Murray, M. C., & Pérez, J. of Kennesaw State University. 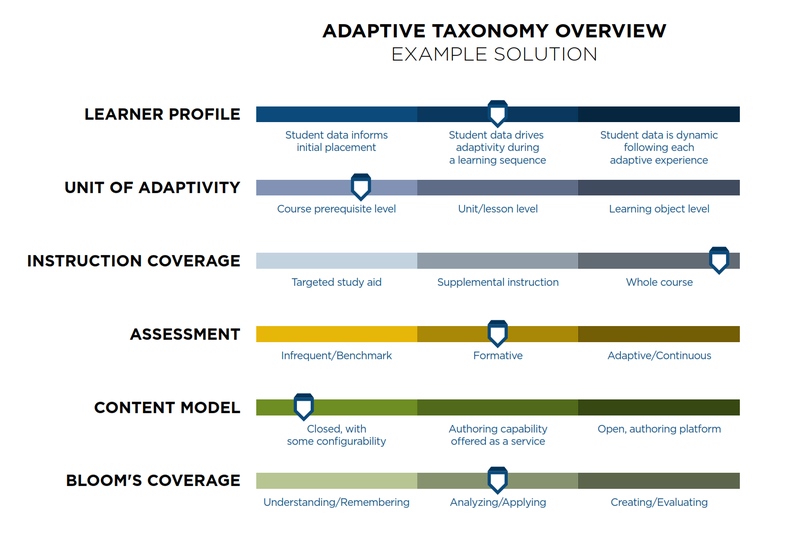 The article is worth reading, not least because of the authors’ digestible review of adaptive learning theory and their discussion of levels of adaptation, including a handy diagram (see below) which they have reproduced from a white paper by Tyton Partners ‘Learning to Adapt: Understanding the Adaptive Learning Supplier Landscape’. Murray and Pérez make clear that adaptive learning theory is closely connected to the belief that learning is improved when instruction is personalized — adapted to individual learning styles, but their approach is surprisingly uncritical. They write, for example, that the general acceptance of learning styles is evidenced in recommended teaching strategies in nearly every discipline, and learning styles continue to inform the evolution of adaptive learning systems, and quote from the much-quoted Pashler, H., McDaniel, M., Rohrer, D., & Bjork, R. (2008) Learning styles: concepts and evidence, Psychological Science in the Public Interest, 9, 105–119. But Pashler et al concluded that the current evidence supporting the use of learning style-matched approaches is virtually non-existent (see here for a review of Pashler et al). And, in the world of ELT, an article in the latest edition of ELTJ by Carol Lethaby and Patricia Harries disses learning styles and other neuromyths. Given the close connection between adaptive learning theory and learning styles, one might reasonably predict that a comparative study of adaptive learning and traditional learning would not come out with much evidence in support of the former. Murray and Pérez set out, anyway, to explore the hypothesis that adapting instruction to an individual’s learning style results in better learning outcomes. Their study compared adaptive and traditional methods in a university-level digital literacy course. Their conclusion? This study and a few others like it indicate that today’s adaptive learning systems have negligible impact on learning outcomes. I was, however, more interested in the comments which followed this general conclusion. They point out that learning outcomes are only one measure of quality. Others, such as student persistence and engagement, they claim, can be positively affected by the employment of adaptive systems. I am not convinced. I think it’s simply far too soon to be able to judge this, and we need to wait quite some time for novelty effects to wear off. Murray and Pérez provide two references in support of their claim. One is an article by Josh Jarrett, Bigfoot, Goldilocks, and Moonshots: A Report from the Frontiers of Personalized Learning in Educause. Jarrett is Deputy Director for Postsecondary Success at the Bill & Melinda Gates Foundation and Educause is significantly funded by the Gates Foundation. Not, therefore, an entirely unbiased and trustworthy source. The other is a journalistic piece in Forbes. It’s by Tim Zimmer, entitled Rethinking higher ed: A case for adaptive learning and it reads like an advert. Zimmer is a ‘CCAP contributor’. CCAP is the Centre for College Affordability and Productivity, a libertarian, conservative foundation with a strong privatization agenda. Not, therefore, a particularly reliable source, either. Despite their own findings, Murray and Pérez follow up their claim about student persistence and engagement with what they describe as a more compelling still argument for adaptive learning. This, they say, is the intuitively appealing case for adaptive learning systems as engines with which institutions can increase access and reduce costs. Ah, now we’re getting to the point! In ELT circles, ‘behaviourism’ is a boo word. In the standard history of approaches to language teaching (characterised as a ‘procession of methods’ by Hunter & Smith 2012: 432), there were the bad old days of behaviourism until Chomsky came along, savaged the theory in his review of Skinner’s ‘Verbal Behavior’, and we were all able to see the light. In reality, of course, things weren’t quite like that. The debate between Chomsky and the behaviourists is far from over, behaviourism was not the driving force behind the development of audiolingual approaches to language teaching, and audiolingualism is far from dead. For an entertaining and eye-opening account of something much closer to reality, I would thoroughly recommend a post on Russ Mayne’s Evidence Based ELT blog, along with the discussion which follows it. For anyone who would like to understand what behaviourism is, was, and is not (before they throw the term around as an insult), I’d recommend John A. Mills’ ‘Control: A History of Behavioral Psychology’ (New York University Press, 1998) and John Staddon’s ‘The New Behaviorism 2nd edition’ (Psychology Press, 2014). That there is a strong connection between adaptive learning and behaviourism is indisputable, but I am not interested in attempting to establish the strength of that connection. This would, in any case, be an impossible task without some reductionist definition of both terms. Instead, my interest here is to explore some of the parallels between the two, and, in the spirit of the topic, I’d like to do this by comparing the behaviours of behaviourists and adaptive learning scientists. Both behaviourism and adaptive learning (in its big data form) are centrally concerned with behaviour – capturing and measuring it in an objective manner. In both, experimental observation and the collection of ‘facts’ (physical, measurable, behavioural occurrences) precede any formulation of theory. John Mills’ description of behaviourists could apply equally well to adaptive learning scientists: theory construction was a seesaw process whereby one began with crude outgrowths from observations and slowly created one’s theory in such a way that one could make more and more precise observations, building those observations into the theory at each stage. No behaviourist ever considered the possibility of taking existing comprehensive theories of mind and testing or refining them. Both behaviourism and adaptive learning are pragmatically positivist, believing that truth can be established by the study of facts. J. B. Watson, the founding father of behaviourism whose article ‘Psychology as the Behaviorist Views It’ set the behaviourist ball rolling, believed that experimental observation could ‘reveal everything that can be known about human beings’. Jose Ferreira of Knewton has made similar claims: We get five orders of magnitude more data per user than Google does. We get more data about people than any other data company gets about people, about anything — and it’s not even close. We’re looking at what you know, what you don’t know, how you learn best. […] We know everything about what you know and how you learn best because we get so much data. Digital data analytics offer something that Watson couldn’t have imagined in his wildest dreams, but he would have approved. Big data (and the adaptive learning which is a part of it) is presented as a game-changer: The era of big data challenges the way we live and interact with the world. […] Society will need to shed some of its obsession for causality in exchange for simple correlations: not knowing why but only what. This overturns centuries of established practices and challenges our most basic understanding of how to make decisions and comprehend reality. But the reverence for technology and the ability to reach understandings of human beings by capturing huge amounts of behavioural data was adumbrated by Watson a century before big data became a widely used term. Watson’s 1913 lecture at Columbia University was ‘a clear pitch’ for the supremacy of behaviourism, and its potential as a revolutionary science. The fundamental point of both behaviourism and adaptive learning is the same. The research practices and the theorizing of American behaviourists until the mid-1950s, writes Mills were driven by the intellectual imperative to create theories that could be used to make socially useful predictions. Predictions are only useful to the extent that they can be used to manipulate behaviour. Watson states this very baldly: the theoretical goal of psychology is the prediction and control of behaviour. 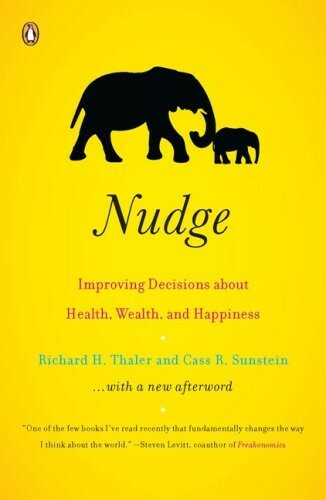 Contemporary iterations of behaviourism, such as behavioural economics or nudge theory (see, for example, Thaler & Sunstein’s best-selling ‘Nudge’, Penguin Books, 2008), or the British government’s Behavioural Insights Unit, share the same desire to divert individual activity towards goals (selected by those with power), ‘without either naked coercion or democratic deliberation’. Jose Ferreira of Knewton has an identical approach: We can predict failure in advance, which means we can pre-remediate it in advance. We can say, “Oh, she’ll struggle with this, let’s go find the concept from last year’s materials that will help her not struggle with it.” Like the behaviourists, Ferreira makes grand claims about the social usefulness of his predict-and-control technology: The end is a really simple mission. Only 22% of the world finishes high school, and only 55% finish sixth grade. Those are just appalling numbers. As a species, we’re wasting almost four-fifths of the talent we produce. […] I want to solve the access problem for the human race once and for all. Because they rely on capturing large amounts of personal data, both behaviourism and adaptive learning quickly run into ethical problems. Even where informed consent is used, the subjects must remain partly ignorant of exactly what is being tested, or else there is the fear that they might adjust their behaviour accordingly. The goal is to minimise conscious understanding of what is going on. For adaptive learning, the ethical problem is much greater because of the impossibility of ensuring the security of this data. Everything is hackable. Behaviourism was seen as a god-send by the world of advertising. J. B. Watson, after a front-page scandal about his affair with a student, and losing his job at John Hopkins University, quickly found employment on Madison Avenue. ‘Scientific advertising’, as practised by the Mad Men from the 1920s onwards, was based on behaviourism. The use of data analytics by Google, Amazon, et al is a direct descendant of scientific advertising, so it is richly appropriate that adaptive learning is the child of data analytics. Hunter, D. and Smith, R. (2012) ‘Unpacking the past: “CLT” through ELTJ keywords’. ELT Journal, 66/4: 430-439. A good example is when we look at the knowledge graph of our partners, which is a map of how concepts relate to other concepts and prerequisites within their product. There may be two or three prerequisites identified in a knowledge graph that a student needs to learn in order to understand a next concept. And when we have hundreds of thousands of students progressing through a course, we begin to understand the efficacy of those said prerequisites, which quite frankly were made by an author or set of authors. In most cases they’re quite good because these authors are actually good in what they do. But in a lot of cases we may find that one of those prerequisites actually is not necessary, and not proven to be useful in achieving true learning or understanding of the current concept that you’re trying to learn. This is interesting information that can be brought back to the publisher as they do revisions, as they actually begin to look at the content as a whole. One commenter on the post, Tom Ewens, found the idea interesting. It could, potentially, he wrote, give us new insights into how languages are learned much in the same way as how corpora have given us new insights into how language is used. Did Knewton have any plans to disseminate the information publicly, he asked. His question remains unanswered. At the time, Knewton had just raised $51 million (bringing their total venture capital funding to over $105 million). 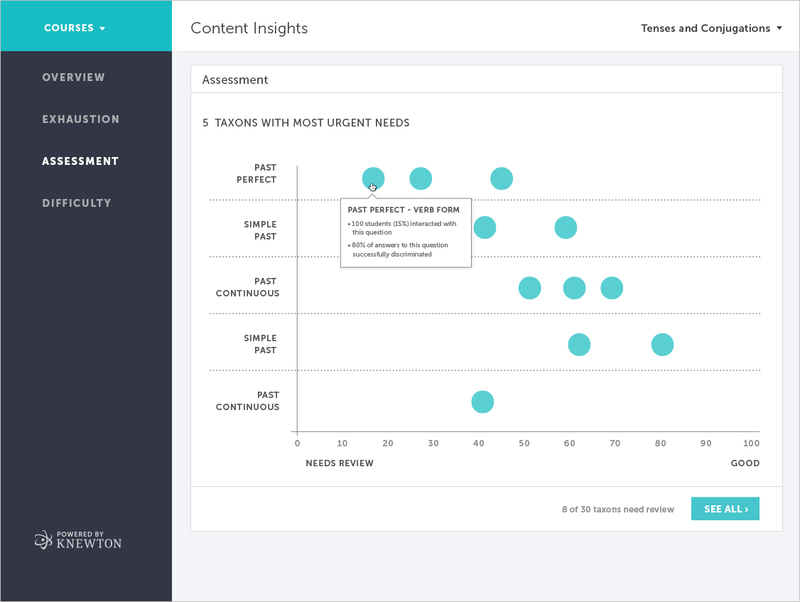 Now, 16 months later, Knewton have launched their new product, which they are calling Knewton Content Insights. 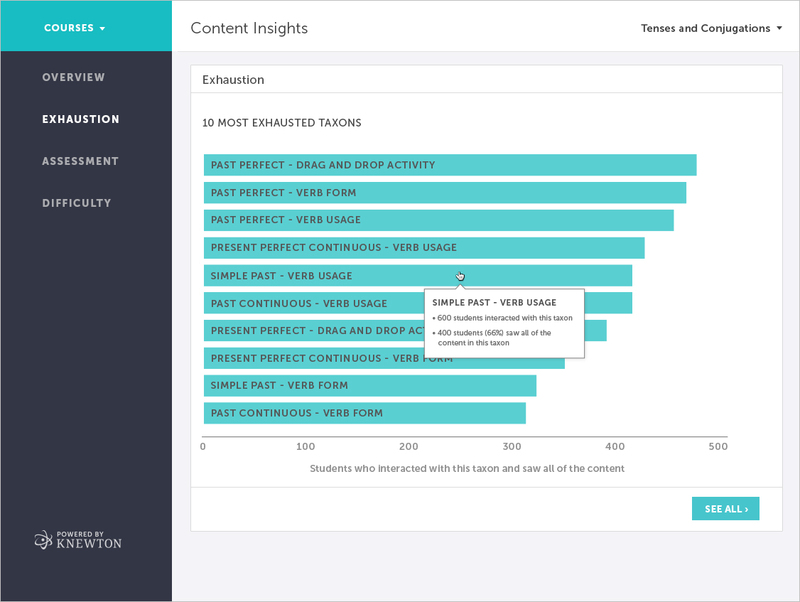 They describe it as the world’s first and only web-based engine to automatically extract statistics comparing the relative quality of content items — enabling us to infer more information about student proficiency and content performance than ever before possible. The software analyses particular exercises within the learning content (and particular items within them). It measures the relative difficulty of individual items by, for example, analysing how often a question is answered incorrectly and how many tries it takes each student to answer correctly. It also looks at what they call ‘exhaustion’ – how much content students are using in a particular area – and whether they run out of content. The software can correlate difficulty with exhaustion. Lastly, it analyses what they call ‘assessment quality’ – how well individual questions assess a student’s understanding of a topic. Knewton’s approach is premised on the idea that learning (in this case language learning) can be broken down into knowledge graphs, in which the information that needs to be learned can be arranged and presented hierarchically. The ‘granular’ concepts are then ‘delivered’ to the learner, and Knewton’s software can optimise the delivery. The first problem, as I explored in a previous post, is that language is a messy, complex system: it doesn’t lend itself terribly well to granularisation. The second problem is that language learning does not proceed in a linear, hierarchical way: it is also messy and complex. The third is that ‘language learning content’ cannot simply be delivered: a process of mediation is unavoidable. Are the people at Knewton unaware of the extensive literature devoted to the differences between synthetic and analytic syllabuses, of the differences between product-oriented and process-oriented approaches? It would seem so. Knewton’s ‘Content Insights’ can only, at best, provide some sort of insight into the ‘language knowledge’ part of any learning content. It can say nothing about the work that learners do to practise language skills, since these are not susceptible to granularisation: you simply can’t take a piece of material that focuses on reading or listening and analyse its ‘content efficacy at the concept level’. Because of this, I predicted (in the post about Knowledge Graphs) that the likely focus of Knewton’s analytics would be discrete item, sentence-level grammar (typically tenses). It turns out that I was right. Knewton illustrate their new product with screen shots such as those below. They give a specific example of the sort of questions their software can answer. It is: do students generally find the present simple tense easier to understand than the present perfect tense? Doh! It may be the case that Knewton Content Insights might optimise the presentation of this kind of grammar, but optimisation of this presentation and practice is highly unlikely to have any impact on the rate of language acquisition. Students are typically required to study the present perfect at every level from ‘elementary’ upwards. They have to do this, not because the presentation in, say, Headway, is not optimised. What they need is to spend a significantly greater proportion of their time on ‘language use’ and less on ‘language knowledge’. This is not just my personal view: it has been extensively researched, and I am unaware of any dissenting voices. The number-crunching in Knewton Content Insights is unlikely, therefore, to lead to any actionable insights. It is, however, very likely to lead (as writer colleagues at Pearson and other publishers are finding out) to an obsession with measuring the ‘efficacy’ of material which, quite simply, cannot meaningfully be measured in this way. It is likely to distract from much more pressing issues, notably the question of how we can move further and faster away from peddling sentence-level, discrete-item grammar. In the long run, it is reasonable to predict that the attempt to optimise the delivery of language knowledge will come to be seen as an attempt to tackle the wrong question. It will make no significant difference to language learners and language learning. In the short term, how much time and money will be wasted? [i] ‘Efficacy’ is the buzzword around which Pearson has built its materials creation strategy, a strategy which was launched around the same time as this interview. Pearson is a major investor in Knewton. Jose Ferreira, the fast-talking sales rep-in-chief of Knewton, likes to dazzle with numbers. In a 2012 talk hosted by the US Department of Education, Ferreira rattles off the stats: So Knewton students today, we have about 125,000, 180,000 right now, by December it’ll be 650,000, early next year it’ll be in the millions, and next year it’ll be close to 10 million. And that’s just through our Pearson partnership. For each of these students, Knewton gathers millions of data points every day. That, brags Ferreira, is five orders of magnitude more data about you than Google has. … We literally have more data about our students than any company has about anybody else about anything, and it’s not even close. With just a touch of breathless exaggeration, Ferreira goes on: We literally know everything about what you know and how you learn best, everything. The data is mined to find correlations between learning outcomes and learning behaviours, and, once correlations have been established, learning programmes can be tailored to individual students. Ferreira explains: We take the combined data problem all hundred million to figure out exactly how to teach every concept to each kid. So the 100 million first shows up to learn the rules of exponents, great let’s go find a group of people who are psychometrically equivalent to that kid. They learn the same ways, they have the same learning style, they know the same stuff, because Knewton can figure out things like you learn math best in the morning between 8:40 and 9:13 am. You learn science best in 42 minute bite sizes the 44 minute mark you click right, you start missing questions you would normally get right. The basic premise here is that the more data you have, the more accurately you can predict what will work best for any individual learner. But how accurate is it? 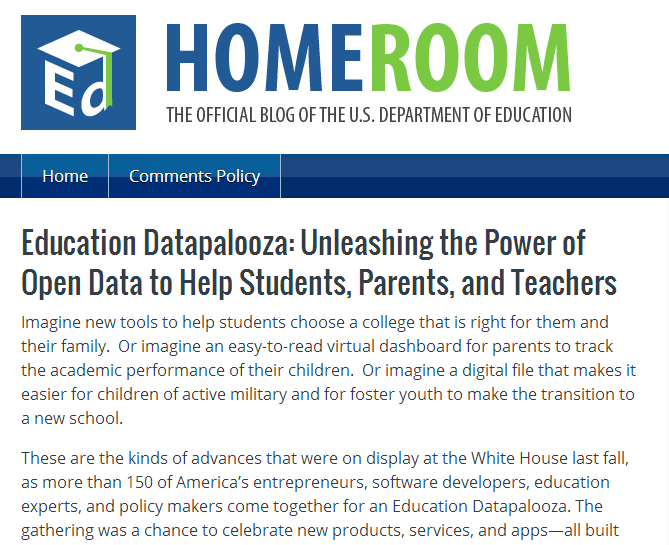 In the absence of any decent, independent research (or, for that matter, any verifiable claims from Knewton), how should we respond to Ferreira’s contribution to the White House Education Datapalooza? 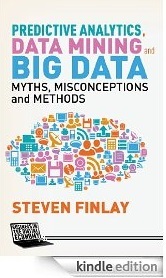 A new book by Stephen Finlay, Predictive Analytics, Data Mining and Big Data (Palgrave Macmillan, 2014) suggests that predictive analytics are typically about 20 – 30% more accurate than humans attempting to make the same judgements. That’s pretty impressive and perhaps Knewton does better than that, but the key thing to remember is that, however much data Knewton is playing with, and however good their algorithms are, we are still talking about predictions and not certainties. If an adaptive system could predict with 90% accuracy (and the actual figure is typically much lower than that) what learning content and what learning approach would be effective for an individual learner, it would still mean that it was wrong 10% of the time. When this is scaled up to the numbers of students that use Knewton software, it means that millions of students are getting faulty recommendations. Beyond a certain point, further expansion of the data that is mined is unlikely to make any difference to the accuracy of predictions. A further problem identified by Stephen Finlay is the tendency of people in predictive analytics to confuse correlation and causation. Certain students may have learnt maths best between 8.40 and 9.13, but it does not follow that they learnt it best because they studied at that time. If strong correlations do not involve causality, then actionable insights (such as individualised course design) can be no more than an informed gamble. Knewton’s claim that they know how every student learns best is marketing hyperbole and should set alarm bells ringing. When it comes to language learning, we simply do not know how students learn (we do not have any generally accepted theory of second language acquisition), let alone how they learn best. More data won’t help our theories of learning! Ferreira’s claim that, with Knewton, every kid gets a perfectly optimized textbook, except it’s also video and other rich media dynamically generated in real time is equally preposterous, not least since the content of the textbook will be at least as significant as the way in which it is ‘optimized’. And, as we all know, textbooks have their faults. Cui bono? Perhaps huge data and predictive analytics will benefit students; perhaps not. We will need to wait and find out. 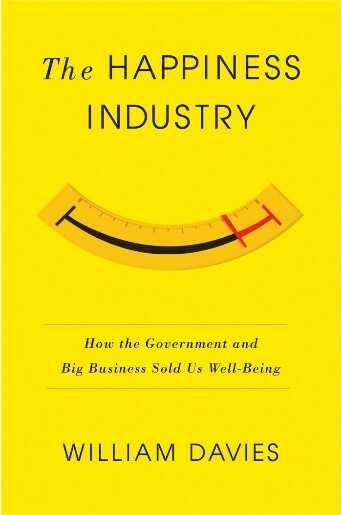 But Stephen Finlay reminds us that in gold rushes (and internet booms and the exciting world of Big Data) the people who sell the tools make a lot of money. Far more strike it rich selling picks and shovels to prospectors than do the prospectors. Likewise, there is a lot of money to be made selling Big Data solutions. Whether the buyer actually gets any benefit from them is not the primary concern of the sales people. (p.16/17) Which is, perhaps, one of the reasons that some sales people talk so fast. We now have young learners and very young learners, learner differences and learner profiles, learning styles, learner training, learner independence and autonomy, learning technologies, life-long learning, learning management systems, virtual learning environments, learning outcomes, learning analytics and adaptive learning. Much, but not perhaps all, of this is to the good, but it’s easy to forget that it wasn’t always like this. 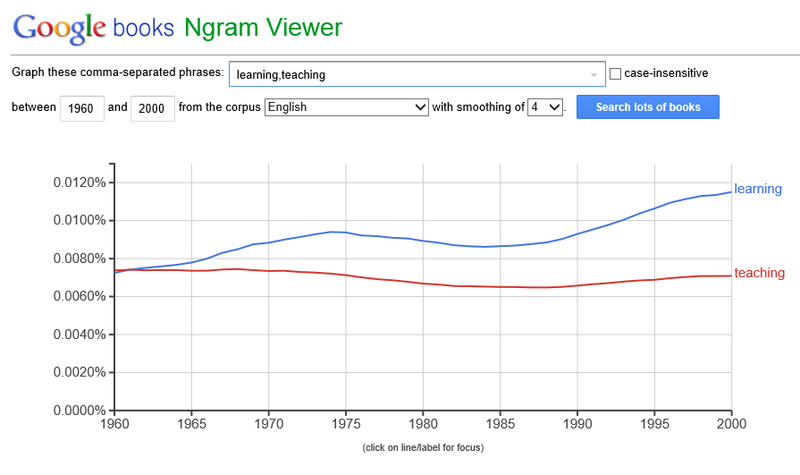 The rise in the use of the terms ‘learner’ and ‘learning’ can be seen in policy documents, educational research and everyday speech, and it really got going in the mid 1980s. Duncan Hunter and Richard Smith have identified a similar trend in ELT after analysing a corpus of articles from the English Language Teaching Journal. They found that ‘learner’ had risen to near the top of the key-word pile in the mid 1980s, but had been practically invisible 15 years previously. Accompanying this rise has been a relative decline of words like ‘teacher’, ‘teaching’, ‘pupil’ and, even, ‘education’. Gert Biesta has described this shift in discourse as a ‘new language of learning’ and the ‘learnification of education’. It’s not hard to see the positive side of this change in focus towards the ‘learner’ and away from the syllabus, the teachers and the institution in which the ‘learning’ takes place. We can, perhaps, be proud of our preference for learner-centred approaches over teacher-centred ones. We can see something liberating (for our students) in the change of language that we use. But, as Bingham and Biesta have pointed out, this gain is also a loss. The language of ‘learners’ and ‘learning’ focusses our attention on process – how something is learnt. This was a much-needed corrective after an uninterrupted history of focussing on end-products, but the corollary is that it has become very easy to forget not only about the content of language learning, but also its purposes and the social relationships through which it takes place. There has been some recent debate about the content of language learning, most notably in the work of the English as a Lingua Franca scholars. But there has been much more attention paid to the measurement of the learners’ acquisition of that content (through the use of tools like the Pearson Global Scale of English). There is a growing focus on ‘granularized’ content – lists of words and structures, and to a lesser extent language skills, that can be easily measured. It looks as though other things that we might want our students to be learning – critical thinking skills and intercultural competence, for example – are being sidelined. More significant is the neglect of the purposes of language learning. The discourse of ELT is massively dominated by the paying sector of private language schools and semi-privatised universities. In these contexts, questions of purpose are not, perhaps, terribly important, as the whole point of the enterprise can be assumed to be primarily instrumental. But the vast majority of English language learners around the world are studying in state-funded institutions as part of a broader educational programme, which is as much social and political as it is to do with ‘learning’. 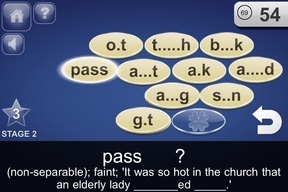 The ultimate point of English lessons in these contexts is usually stated in much broader terms. The Council of Europe’s Common European Framework of Reference, for example, states that the ultimate point of the document is to facilitate better intercultural understanding. It is very easy to forget this when we are caught up in the business of levels and scales and measuring learning outcomes. Lastly, a focus on ‘learners’ and ‘learning’ distracts attention away from the social roles that are enacted in classrooms. 25 years ago, Henry Widdowson pointed out that there are two quite different kinds of role. The first of these is concerned with occupation (student / pupil vs teacher / master / mistress) and is identifying. The second (the learning role) is actually incidental and cannot be guaranteed. He reminds us that the success of the language learning / teaching enterprise depends on ‘recognizing and resolving the difficulties inherent in the dual functioning of roles in the classroom encounter’. Again, this may not matter too much in the private sector, but, elsewhere, any attempt to tackle the learning / teaching conundrum through an exclusive focus on learning processes is unlikely to succeed. The ‘learnification’ of education has been accompanied by two related developments: the casting of language learners as consumers of a ‘learning experience’ and the rise of digital technologies in education. For reasons of space, I will limit myself to commenting on the second of these. Research by Geir Haugsbakk and Yngve Nordkvelle has documented a clear and critical link between the new ‘language of learning’ and the rhetoric of edtech advocacy. These researchers suggest that these discourses are mutually reinforcing, that both contribute to the casting of the ‘learner’ as a consumer, and that the coupling of learning and digital tools is often purely rhetorical. One of the net results of ‘learnification’ is the transformation of education into a technical or technological problem to be solved. It suggests, wrongly, that approaches to education can be derived purely from theories of learning. By adopting an ahistorical and apolitical standpoint, it hides ‘the complex nexus of political and economic power and resources that lies behind a considerable amount of curriculum organization and selection’. The very real danger, as Biesta has observed, is that ‘if we fail to engage with the question of good education head-on – there is a real risk that data, statistics and league tables will do the decision-making for us’. I suggested in the previous post that the research of Jayaprakash et al had confirmed something that we already knew concerning the reasons why some students drop out of college. However, predictive analytics are only part of the story. As the authors of this paper point out, they ‘do not influence course completion and retention rates without being combined with effective intervention strategies aimed at helping at-risk students succeed’. The point of predictive analytics is to facilitate the deployment of effective and appropriate interventions strategies, and to do this sooner than would be possible without the use of the analytics. So, it is to these intervention strategies that I now turn. The design of these interventions was based on the work that had been done at Purdue, which was, in turn, inspired by the work of Vince Tinto, one of the world’s leading experts on student retention issues. The work done at Purdue had shown that simple notifications to students that they were at risk could have a significant, and positive, effect on student behaviour. Jayaprakash and the research team took the students who had been identified as at-risk by the analytics and divided them into three groups: the first were issued with ‘awareness messages’, the second were offered a combination of the other three interventions in the bullet point list above, and the third, a control group, had no interventions at all. The results showed that the students who were in treatment groups (of either kind of intervention) showed a statistically significant improvement compared to those who received no treatment at all. However, there seemed to be no difference in the effectiveness of the different kinds of intervention. So far, so good, but, once again, I was left thinking that I hadn’t really learned very much from all this. But then, in the last five pages, the article suddenly got very interesting. Remember that the primary purpose of this whole research project was to find ways of helping not just at-risk students, but specifically socioeconomically disadvantaged at-risk students (such as those receiving Pell Grants). Accordingly, the researchers then focussed on this group. What did they find? Once again, interventions proved more effective at raising student scores than no intervention at all. However, the averages of final scores are inevitably affected by drop-out rates (since students who drop out do not have final scores which can be included in the averages). 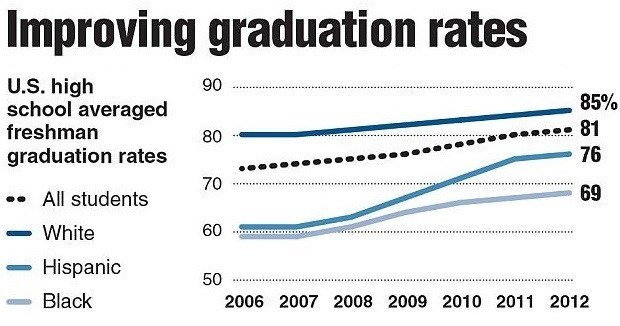 At Purdue, the effect of interventions on drop-out rates had not been found to be significant. Remember that Purdue has a relatively well-off student demographic. However, in this research, which focussed on colleges with a much higher proportion of students on Pell Grants, the picture was very different. Of the Pell Grant students who were identified as at-risk and who were given some kind of treatment, 25.6% withdrew from the course. Of the Pell Grant students who were identified as at-risk but who were not ‘treated’ in any way (i.e. those in the control group), only 14.1% withdrew from the course. I recommend that you read those numbers again! The research programme had resulted in substantially higher drop-out rates for socioeconomically disadvantaged students – the precise opposite of what it had set out to achieve. Jayaprakash et al devote one page of their article to the ethical issues this raises. They suggest that early intervention, resulting in withdrawal, might actually be to the benefit of some students who were going to fail whatever happened. It is better to get a ‘W’ (withdrawal) grade on your transcript than an ‘F’ (fail), and you may avoid wasting your money at the same time. This may be true, but it would be equally true that not allowing at-risk students (who, of course, are disproportionately from socioeconomically disadvantaged backgrounds) into college at all might also be to their ‘benefit’. The question, though, is: who has the right to make these decisions on behalf of other people? The authors also acknowledge another ethical problem. The predictive analytics which will prompt the interventions are not 100% accurate. 85% accuracy could be considered a pretty good figure. This means that some students who are not at-risk are labelled as at-risk, and other who are at-risk are not identified. Of these two possibilities, I find the first far more worrying. We are talking about the very real possibility of individual students being pushed into making potentially life-changing decisions on the basis of dodgy analytics. How ethical is that? The authors’ conclusion is that the situation forces them ‘to develop the most accurate predictive models possible, as well as to take steps to reduce the likelihood that any intervention would result in the necessary withdrawal of a student’. I find this extraordinary. It is premised on the assumption that predictive models can be made much, much more accurate. They seem to be confusing prediction and predeterminism. A predictive model is, by definition, only predictive. There will always be error. How many errors are ethically justifiable? And, the desire to reduce the likelihood of unnecessary withdrawals is a long way from the need to completely eliminate the likelihood of unnecessary withdrawals, which seems to me to be the ethical position. More than anything else in the article, this sentence illustrates that the a priori assumption is that predictive analytics can be a force for good, and that the only real problem is getting the science right. If a number of young lives are screwed up along the way, we can at least say that science is getting better. In the authors’ final conclusion, they describe the results of their research as ‘promising’. They do not elaborate on who it is promising for. They say that relatively simple intervention strategies can positively impact student learning outcomes, but they could equally well have said that relatively simple intervention strategies can negatively impact learning outcomes. They could have said that predictive analytics and intervention programmes are fine for the well-off, but more problematic for the poor. Remembering once more that the point of the study was to look at the situation of socioeconomically disadvantaged at-risk students, it is striking that there is no mention of this group in the researchers’ eight concluding points. The vast bulk of the paper is devoted to technical descriptions of the design and training of the software; the majority of the conclusions are about the validity of that design and training. The ostensibly intended beneficiaries have got lost somewhere along the way. How and why is it that a piece of research such as this can so positively slant its results? In the third and final part of this mini-series, I will turn my attention to answering that question. In the 8th post on this blog (‘Theory, Research and Practice’), I referred to the lack of solid research into learning analytics. Whilst adaptive learning enthusiasts might disagree with much, or even most, of what I have written on this subject, here, at least, was an area of agreement. May of this year, however, saw the launch of the inaugural issue of the Journal of Learning Analytics, the first journal ‘dedicated to research into the challenges of collecting, analysing and reporting data with the specific intent to improve learning’. It is a peer-reviewed, open-access journal, available here , which is published by the Society for Learning Analytics Research (SoLAR), a consortium of academics from 9 universities in the US, Canada, Britain and Australia. I decided to take a closer look. In this and my next two posts, I will focus on one article from this inaugural issue. It’s called Early Alert of Academically At‐Risk Students: An Open Source Analytics Initiative and it is co-authored by Sandeep M. Jayaprakash, Erik W. Moody, Eitel J.M. Lauría, James R. Regan, and Joshua D. Baron of Marist College in the US. Bear with me, please – it’s more interesting than it might sound! The background to this paper is the often referred to problem of college drop-outs in the US, and the potential of learning analytics to address what is seen as a ‘national challenge’. The most influential work that has been done in this area to date was carried out at Purdue University. Purdue developed an analytical system, called Course Signals, which identified students at risk of course failure and offered a range of interventions (more about these in the next post) which were designed to improve student outcomes. I will have more to say about the work at Purdue in my third post, but, for the time being, it is enough to say that, in the field, it has been considered very successful, and that the authors of the paper I looked at have based their approach on the work done at Purdue. Jayaprakash et al developed their own analytical system, based on Purdue’s Course Signals, and used it at their own institution, Marist College. Basically, they wanted to know if they could replicate the good results that had been achieved at Purdue. They then took the same analytical system to four different institutions, of very different kinds (public, as opposed to private; community colleges offering 2-year programmes rather than universities) to see if the results could be replicated there, too. They also wanted to find out if the interventions with students who had been signalled as at-risk would be as effective as they had been at Purdue. So far, so good: it is clearly very important to know if one particular piece of research has any significance beyond its immediate local context. So, what did Jayaprakash et al find out? Basically, they learnt that their software worked as well at Marist as Course Signals had done at Purdue. They collected data on student demographics and aptitude, course grades and course related data, data on students’ interactions with the LMS they were using and performance data captured by the LMS. Oh, yes, and absenteeism. At the other institutions where they trialled their software, the system was 10% less accurate in predicting drop-outs, but the authors of the research still felt that ‘predictive models developed based on data from one institution may be scalable to other institutions’. But more interesting than the question of whether or not the predictive analytics worked is the question of which specific features of the data were the most powerful predictors. What they discovered was that absenteeism was highly significant. No surprises there. They also learnt that the other most powerful predictors were (1) the students’ cumulative grade point average (GPA), an average of a student’s academic scores over their entire academic career, and (2) the scores recorded by the LMS of the work that students had done during the course which would contribute to their final grade. No surprises there, either. As the authors point out, ‘given that these two attributes are such fundamental aspects of academic success, it is not surprising that the predictive model has fared so well across these different institutions’. Agreed, it is not surprising at all that students with lower scores and a history of lower scores are more likely to drop out of college than students with higher scores. But, I couldn’t help wondering, do we really need sophisticated learning analytics to tell us this? Wouldn’t any teacher know this already? They would, of course, if they knew their students, but if the teacher: student ratio is in the order of 1: 100 (not unheard of in lower-funded courses delivered primarily through an LMS), many teachers (and their students) might benefit from automated alert systems. But back to the differences between the results at Purdue and Marist and at the other institutions. Why were the predictive analytics less successful at the latter? The answer is in the nature of the institutions. Essentially, it boils down to this. In institutions with low drop-out rates, the analytics are more reliable than in institutions with high drop-out rates, because the more at-risk students there are, the harder it is to predict the particular individuals who will actually drop out. Jayaprakash et al provide the key information in a useful table. Students at Marist College are relatively well-off (only 16% receive Pell Grants, which are awarded to students in financial need), and only a small number (12%) are from ‘ethnic minorities’. The rate of course non-completion in normal time is relatively low (at 20%). In contrast, at one of the other institutions, the College of the Redwoods in California, 44% of the students receive Pell Grants and 22% of them are from ‘ethnic minorities’. The non-completion rate is a staggering 96%. At Savannah State University, 78% of the students receive Pell Grants, and the non-completion rate is 70%. The table also shows the strong correlation between student poverty and high student: faculty ratios. In other words, the poorer you are, the less likely you are to complete your course of study, and the less likely you are to know your tutors (these two factors also correlate). In other other words, the whiter you are, the more likely you are to complete your course of study (because of the strong correlations between race and poverty). While we are playing the game of statistical correlations, let’s take it a little further. As the authors point out, ‘there is considerable evidence that students with lower socio-economic status have lower GPAs and graduation rates’. If, therefore, GPAs are one of the most significant predictors of academic success, we can say that socio-economic status (and therefore race) is one of the most significant predictors of academic success … even if the learning analytics do not capture this directly. Actually, we have known this for a long time. The socio-economic divide in education is frequently cited as one of the big reasons for moving towards digitally delivered courses. This particular piece of research was funded (more about this in the next posts) with the stipulation that it ‘investigated and demonstrated effective techniques to improve student retention in socio-economically disadvantaged populations’. We have also known for some time that digitally delivered education increases the academic divide between socio-economic groups. So what we now have is a situation where a digital technology (learning analytics) is being used as a partial solution to a problem that has always been around, but which has been exacerbated by the increasing use of another digital technology (LMSs) in education. We could say, then, that if we weren’t using LMSs, learning analytics would not be possible … but we would need them less, anyway. My next post will look at the results of the interventions with students that were prompted by the alerts generated by the learning analytics. Advance warning: it will make what I have written so far seem positively rosy.